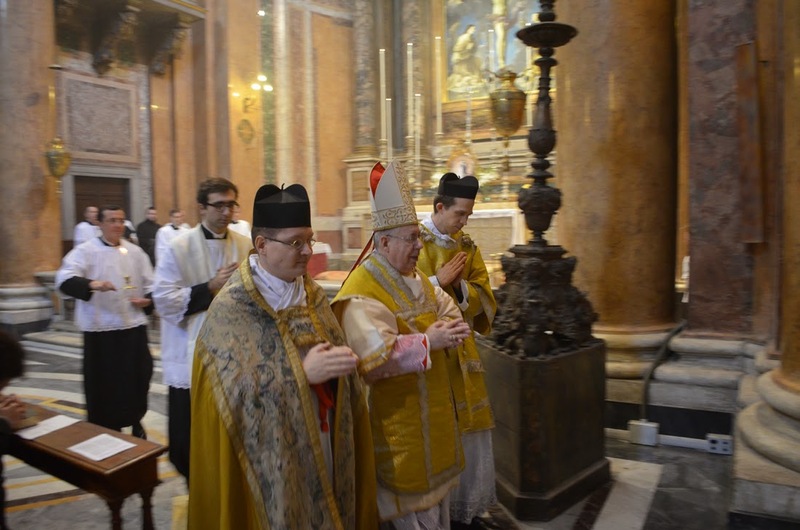 On Trinity Sunday, May 31, at 11 a.m., His Excellency François Bacqué, Titular Archbishop of Gradisca and Apostolic Nuncio, will celebrate Confirmations, followed by Pontifical Mass, at the Priestly Fraternity of St Peter’s Roman parish, Santissima Trinità dei Pellegrini, on the occasion of the parish’s Patronal Feast. This year, the parish also commemorates, along with the Congregation of the Oratory, and the whole city of Rome, the fifth centenary of the birth of the church’s founder, St Philip Neri; next year will see the fourth centenary of the church’s consecration on June 12, 1616. Archbishop Bacqué at Trinità dei Pellegrini on the feast of the Immaculate Conception in 2013.